The organiser of this roadshow (or rather mini-roadshow) is Centre for Environment , Technology and Development Malaysia (CETDEM). CETDEM is inviting the the public to join its Feed-in Tariff (FiT) & SAVE Roadshow in Pahang. It is aimed at promoting the awareness and understanding of Renewable Energy & Energy Efficiency. CETDEM is a non-profit, training, research, consultancy and development organization, which commit itself to improving environmental quality through the appropriate use of technology and sustainable development. you can type CETDEM on your search engine and you will be able to read everything you need to know about the organisation. They have organised a mini-roadshow in Kota Kinabalu on 13 - 14 January 2014 which, to me, was a tricky one to locate. 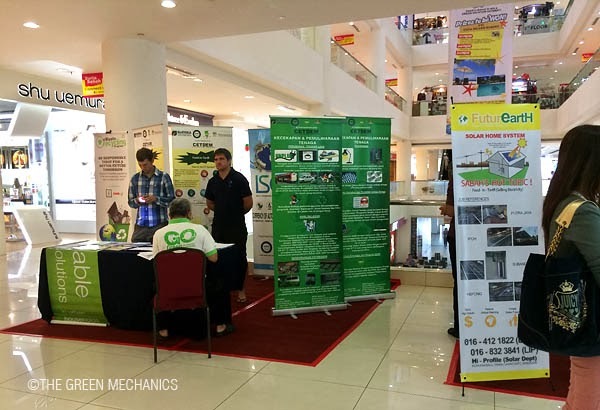 It was scheduled to be located outside senQ at Suria Sabah but when I enquired the folks at the electronic retailer, they seemed to have no knowledge of any booth of any roadshow there. Inquery at the phone listed in the advert also did not help. I managed to find it by accident on my way out of the shopping mall. Hope this would not be the case for the Kuantan roadshow. If CETDEM is not affiliated to any particular RE (FiT) implementer, it should bring in more exhibitor so that the public can have more exhibits to look around. Also, the type of services and product/brands on offer should be wider.